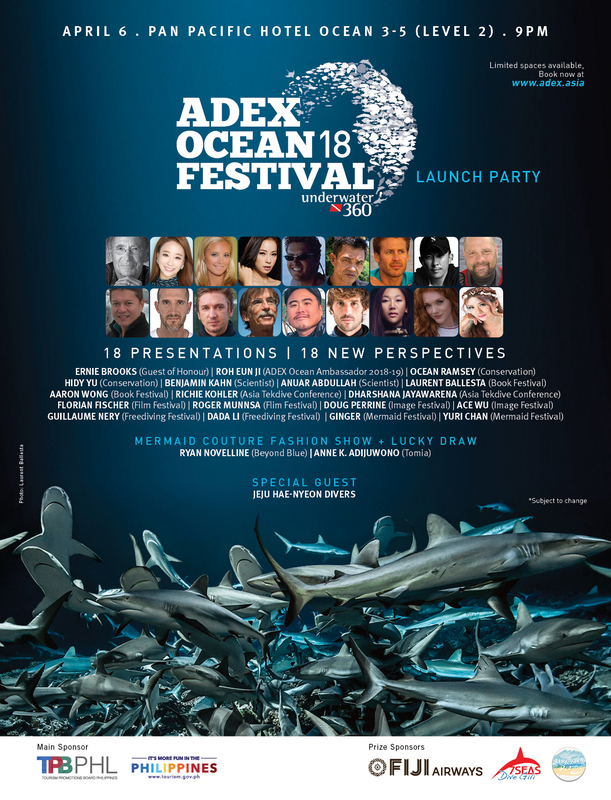 Launching ADEX Ocean18 Festival, dedicated to sharks, ADEX 2018 is proud to present our ADEX OCEAN18 Festival Launch Party on April 6, 2018! With 18 fresh speakers, 18 presentations and 18 new perspectives, join us for a night to remember! With speakers such as Ernie Brooks, Ocean Ramsey, Hidy Yu, Benjamin Kahn, Anuar Abdullah, Laurent Ballesta, Aaron Wong, Richie Kohler, Dharshana Jayawarena, Craig Leeson, Florian Fischer, Doug Perrine, Ace Wu, Guillaume Nery, Dada Li, Ginger, Yuri Chan and more, including special guest appearance from Jeju Island very own Hae-Nyeo Divers launching every aspect of ADEX! Come mingle with over a 130 of your favourite speakers who will be there, be amazed by our Mermaid Couture Fashion Show, and walk away with fabulous prizes!